The UKMTO reported a suspicious approach in the Gulf of Aden on Monday (May 16), where Solace Global security officers responded to an approach by multiple skiffs upon a merchant vessel they were protecting. At 05.12 UTC off the Southern Coast of Yemen, the Solace Global armed security team were approached by five skiffs which came within 90 metres of the vessel. Onboard the skiffs ladders were sighted along with three to five people. The Solace team fired warning shots and the vessel took evasive action. A Solace Global spokesman said that with the crew and vessel safe, this approach continues to remind the industry of the threat in the Gulf of Aden, and helps to validate the recent ICC IMB report statement that ‘the threat of Somali piracy has not been eliminated’. The beginning of May saw the ICC International Maritime Bureau release its Piracy and Robbery Against Ships Report for Q1 of 2016. The report confirmed ‘37 global incidents of piracy and armed robbery reported between January and March 2016’. The report categorised the types of violence to crew as ‘28 crew taken hostage, 26 kidnapped, two injured and one assaulted’. The #IMB piracy report summarised the ‘Off Somalia/Gulf of Aden’ section with the closing comments: ‘As the IMB PRC continues to monitor the situation in the region it cautions shipowners and Masters against complacency. 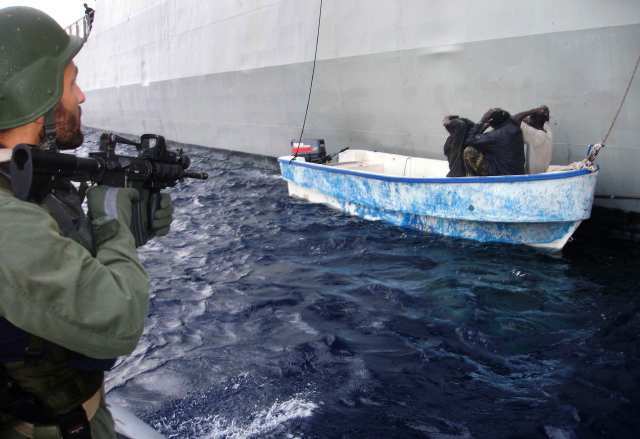 Somali pirates still have the capability and capacity to carry out attacks. The IMB PRC believes that a successful hijacking of a merchant vessel, will rekindle the Somali pirates’ passion to resume its piracy efforts. As of 31st March 2016, suspected Somali Pirates continue to hold 29 crew members for ransom’.